ICICI Prudential Mutual Fund has launched ICICI Prudential India Opportunities Fund, a New Fund Offer (NFO), which will invest in opportunities presented by special situations such as corporate restructuring, Government policy and/or regulatory changes, companies going through temporary unique challenges and other similar instances. The NFO will close on January 9, 2019. Special situations are unique situations that companies may face from time to time, which present investment opportunities to fund managers who can foresee and interpret the implications of that opportunity to generate alphas for investors. We will now discuss where these situations could have resulted in great investment opportunities. Please note the specific examples discussed in this post are not investment ideas or recommendations. We are discussing these examples simply to illustrate how special situations can lead to opportunities. Changes in management led to a fall in the share price of Infosys. The fundamentals of the company were still strong and the fall in share price from levels of Rs 510 to Rs 438 was a well-timed opportunity for investing. Since Aug 2017 to Sep 2018, the company had provided ~70% returns. Sectors may undergo temporary stress due to various reasons such as increasing competition, macro changes in economy, Government reforms & regulatory changes, Global Pressures etc. For example the depreciation of the Rupee was negative for the broader market, but falling rupee has been a tailwind for IT and Export oriented companies. It has been witnessed that changes in Government Regulation or introduction of reforms may lead to special situations in sectors or companies. Some of them are amendment in regulations, change in taxation, fiscal reforms and introduction of Government Policies. The most recent example of a Government reform creating special situation and benefiting certain sectors is Demonetization. Demonetization had a negative impact on the broader market and several sectors like Consumer Durables, Retails, Automobiles, Manufacturing, Aviation, etc. on account of limited liquidity made available in the hands on customers. However, it benefited the financial sectors like banks, insurance companies, NBFC’s, mutual funds etc. With greater integration of our economy and markets with the global economy, global events and uncertainties affect our industries and markets. China Slowdown 2015-2016 affected the metals / commodities industries including India. Commodity companies were dragged down due to worries over global macroeconomic growth environment. Thus, companies like Vedanta Ltd, Hindalco Industries Ltd, Tata Steel Ltd, Jindal Steel and Power Ltd, SAIL fell to multi-year lows. Investing in financially sound companies in the commodity space during this period could have resulted in wealth generation. Why ICICI Prudential India Opportunities Fund NFO? We have illustrated with numerous examples in this blog post, how special situations can lead to great investment opportunities by fund managers a fund manager who can foresee and interpret the implications of that opportunity. This style of investing involves bottom up stock picking style because the core of its investment strategy is identifying companies in special situations. This requires rigorous 360 degree stock research. The scheme will be managed by industry veterans SankaranNaren and RoshanChutkey, who have proven long term track record of alpha generation. The scheme will invest only in companies which have established businesses, proven track record of management and brands which are household names. ICICI Prudential mutual fund is renowned in the mutual fund industry for its strong research capabilities. The macros of Indian economy are strong and improving. Investing in special situation as and when it arises can generate good returns on investments. 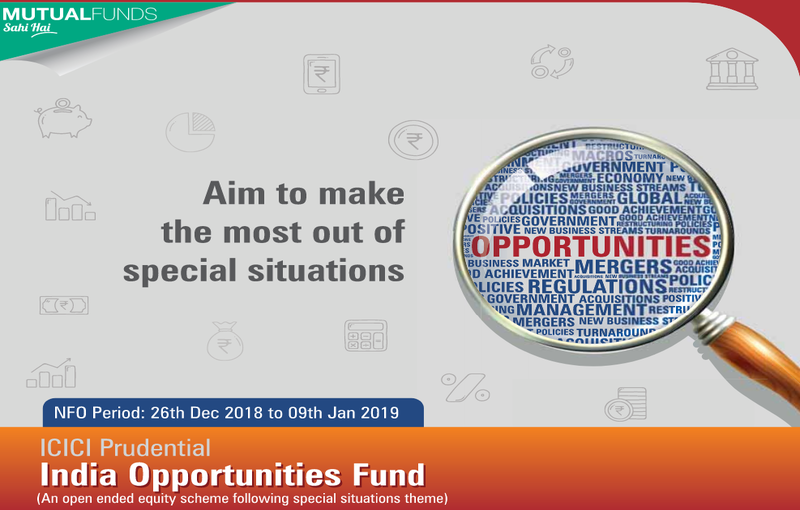 ICICI Prudential India Opportunities Fund (Growth)&ICICI Prudential India Opportunities Fund (Dividend). Investors should read scheme information document and consult with their financial advisors if required before investing.